For the first time ever in sports history, two teams will meet in a championship round for the fourth season in a row. The Golden State Warriors and Cleveland Cavaliers have traded blows since 2015, but the Warriors are expected to repeat as champions. The odds are stacked heavily in Golden State’s favor thanks to its status as a proven champ and an All-Star laden roster. The Cavaliers, meanwhile, are driven by the best player in the NBA in LeBron James and face a challenge similar to last season’s with much less optimism from sportsbooks. Golden State beat James’ Cavs in six games the first time the clubs met in the Finals, then Cleveland responded with a thrilling Game 7 win in 2016 despite trailing 3-1 in the series. The following offseason, superstar Kevin Durant joined the Warriors which led to them decisively dismantling the Cavaliers in five games last summer. Then Cleveland’s star point guard Kyrie Irving, who hit an unforgettable title-winning shot in that 2016 Game 7, was traded in the offseason to Boston. Golden State won both regular season contests fairly handily, but both victories came against a completely different Cavaliers team. Back on February 8th, with LeBron’s return uncertain next season and their record a disappointing 31-22, the Cavaliers went all in for a last ditch effort to build a team that could beat Golden State. At the trade deadline Cleveland added unpolished, yet talented youngsters in Rodney Hood, Jordan Clarkson, Larry Nance Jr. as well as savvy veteran George Hill. In return, the Cavs sent away some of their bigger egos in Isaiah Thomas, Dwyane Wade and Derrick Rose, well-traveled role players Jae Crowder, Channing Frye and Iman Shumpert and a their first-round pick in the 2018 draft. Despite skepticism and a perceived deeper Eastern Conference field, the Cavs battled their way through to the Finals with series wins over the Indiana Pacers, Toronto Raptors and Irving-less Celtics. Now they face their biggest test of the season, but a familiar one for LeBron and a few of his teammates. The “core” of Kevin Love (who missed Game 7 of the Conference Finals with a head injury), J.R. Smith and Tristan Thompson remain from the team that won Cleveland its first sports title in 52 years. Their experience will have to be enough to prepare a fresher, yet rawer group for the challenge of basketball’s biggest stage. The Warriors struggled with injuries and the rise of the James Harden-led Rockets for the majority of this season, with 65-win Houston locking down the first seed in the West. Despite an injury that left them without Steph Curry for the first round, the Warriors dispatched the San Antonio Spurs and New Orleans Pelicans with ease. The Rockets were ready for the Western Conference Finals and even took a 3-2 series lead on Golden State. However, an injury to Chris Paul and Houston's dependence on a three-point attack that ran dry helped the Warriors keep their title defense alive. The Cavaliers are given +600 odds to win a second NBA Championship by SportNation.Bet, +700 by 888sport, 13/2 by Ladbrokes, 11/2 by Betway and 7/1 by Betfair. These are long odds for a LeBron-led squad, but the consensus appears to be that this is the weakest roster the King has had to work with in years. With no Irving this time around, the Cavaliers essentially consist of James and some talented role players against the four-headed monster of Curry, Durant, Klay Thompson and Draymond Green. James will certainly have his greatness tested, as it seemingly is every season according to doubters, but a win or even competitive showing would pay dividends for his legacy. The Cavaliers best chance of winning the series according to sportsbooks appears to be in Game 6 if they can make it that far. 888sport, SportNation.Bet, Betway and Betfair all give the Cavs +2000 odds to do so, and when that’s a team’s best odds, there’s certainly cause for concern in Cleveland. The Warriors are favoured to win their third NBA Championship and do it quickly. The bookmakers don’t expect the series to get past five games as the odds shoot up considerably after that point. 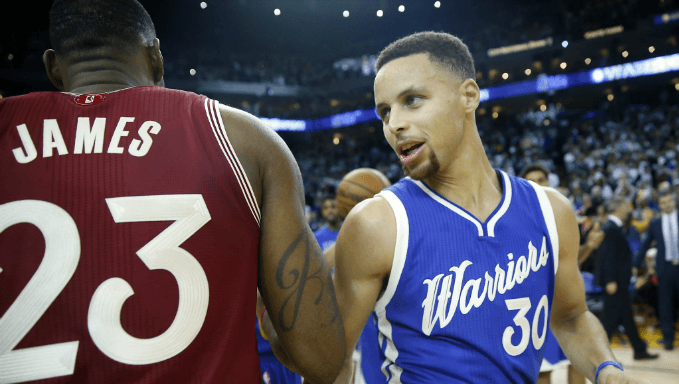 The most likely outcome of the series is the Warriors defeating the Cavaliers in Game 5 which 888sport gives a +115 chance of happening. The Warriors are given +200 odds of sweeping Cleveland by Betfair and 888sport, while SportNation.Bet and Betway offer more profitable bets at +275 and 3/1 odds respectively. The series faces 7/2 odds of just reaching a sixth games according to Betway, so if that should happen, that’s where the real money could be made. Across the board Golden State’s odds of winning the title in Game 6 more than double their odds of doing it one game prior. 888Sport jumps up to +525, SportNation.Bet to +500, Betfair 9/2 and Betway 22/5. In short, if betters believe there’s a chance that the Cavaliers could win even two games, there’s a profitable market there for the taking. If the series were to somehow reach Game 7 (+500 odds 888sport) it would be exciting not just for fans of both teams but opportunistic bettors. Golden State has a +550 chance via 888sport to win should the series go that deep, while Cleveland faces +2500 odds of going the distance with the Warriors and repeating their 2016 success.